What&apos;s the most awesome roadside attraction? Why It's Awesome: Hayward is the home of the Freshwater Fishing Hall of Fame. The Freshwater Fishing Hall of Fame is the home of the world's largest muskie, a giant fish one and a half city blocks long, and four and a half stories tall. Inside, the fish is a museum, containing lures, rods and reels, and a selection of mounted fish and outboard motors. The best part though is the observation deck, located in the mouth of the great beast, and large enough to hold 20 people at a time. Why It's Awesome: If dairy products are your thing, and you're looking for a snack in Kenosha, the Cheese Castle is the place to go. Recently re-opened in newly built, larger digs, the Cheese Castle has moved a little further down the road and now looks less like the old gas station it used to occupy and more like a curd castle. They've expanded their services too - Mars' now offers a restaurant, bigger gift shop, and a cheesy bar. Why It's Awesome: Who wouldn't want to spend some time with some giant dinosaurs on the side of the road? At Dinosaur World that can, and does, happen. Kids love the fossil dig pit, where they can dig up and take home their own souvenirs, as well as the dino-themed playground, but the real attraction is the path through the woods. Along the way, you'll meet all kinds of dinosaurs who are ready and waiting to take photos with the kids. There's another location in Florida as well, if Kentucky's not quite your thing. Why It's Awesome: Lucy the Elephant is a six-story tall wood and tin elephant constructed in 1882. Lucy was actually one of three giant wooden elephants created by the same man in the late 1800's - another was a 12-story tall hotel in Coney Island, NY and the third was on Cape May, also in New Jersey. Unfortunately, Lucy is the only one to have survived to this day. She contains a museum with artifacts from her past in her belly, and a gift shop and small snack stand on the ground floor. Guests used to be able to tour her "howdah" or upper open-air gazebo, but we're unsure if this is possible at this time. Why It's Awesome: Darwin resident Francis Johnson rolled a ball of twine in his spare time for 29 years, before his death in 1979. Since then, Darwin has claimed the record of the world's largest ball of twine made by a single man, unlike other towns which may have larger balls, but guests can add to them. The Darwin ball weighs nearly nine tons and is 12 feet wide. Other cities may have other balls, but this one is the product of a single man's vision. Why It's Awesome: The Big Chicken is not a lot more than a giant red advertisement for the KFC franchise attached to it. It is, however, 56 feet tall and does feature a moving beak and eyes. It was damaged in a storm in 1993, but rebuilt not just due to public outcry, but for the fighter pilots at nearby Dobbins Air Reserve Base. They used the chicken as a navigation icon in the air, just like many of the locals on the ground. Why It's Awesome: Casa Bonita has been selling mediocre mexican food to travelers and Denver locals since 1974. It has an 85-foot tall tower out front, a dome covered in 22 karat gold, and a fountain imported brick-by-brick from Mexico. The biggest attraction though is the 30-foot high waterfall and cliff divers. Casa Bonita boasts 30 attractions for the whole family, and is sure to entertain on your visit to Denver. Why It's Awesome: The present-day Corn Palace is actually the third and largest of the buildings to have worn the name since 1892. It can be rented out for all kinds of events and functions, but if you're visiting on a day nothing is scheduled (which is rare) there is a small museum with Corn Palace historical artifacts. Every year the Palace is redecorated with 13 shades of corn to celebrate a new theme, with thousands of ears nailed into place by hand. Unfortunately, the redecorating process begins in late August and continues until early October, so wait a couple of weeks before planning your visit. Why It's Awesome: Visitors to the Cadillac Ranch are encouraged to add their own mark to the site. The cars get spray painted by guests every day, and are occasionally restored to a single color for events or special occasions, though the repainting rarely lasts more than 24 hours. The cars have been there, nose down in a field, since 1974. Why It's Awesome: Carhenge was built in 1987 by Jim Reinders, and very nearly exactly replicates the setup of Stonehenge in England. This time though, instead of big hunks of rock, Jim used old American cars, painted grey. 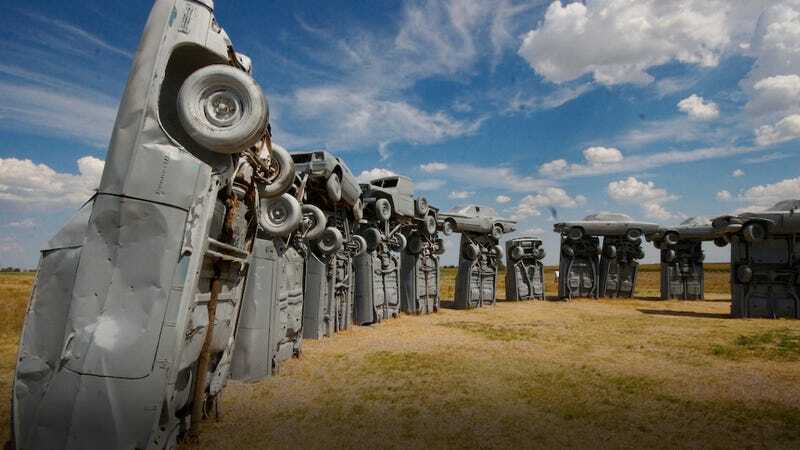 A souvenir stand was recently added to the site, as well as a number of other sculptures throughout the years, making Carhenge an even more exciting attraction. Carhenge itself is open 24 hours a day, seven days a week, 365 days a year, though guests are often reminded that there is no camping on-site.